If you’re on Facebook — and most of us are — you’ve noticed that many users have turned philanthropic to either raise money for nonprofits or personal causes. Whether you run a Facebook business page or are on the platform for personal reasons, you can make use of a fundraiser. You may be most familiar with seeing these fundraisers in connection with a user’s birthday. Instead of asking for wall posts or other digital validation, some have opted to spark generosity by encouraging friends to donate to a charity close to the birthday person’s heart. It makes sense for Facebook to adopt fundraising services, what with the rising popularity of crowdfunding sites such as GoFundMe and Kickstarter. Facebook even changed their donation rules to where non-profits are not charged fees for any sort of fundraising efforts on their platform. If you wish to use Facebook as a source of donations, follow the instructions below. Fundraisers can mean multiple things. It can be a personal fundraiser to help you travel to your birth country. It can be a fundraiser you start for a friend, to ease the financial burden of their unexpected medical emergency. The fundraiser can be for your favorite non-profit, whether they’re in a time of need, or you’re in a time of generosity. While the reasons for raising money are infinite, Facebook distinguishes between two types of fundraisers: fundraisers for nonprofits, and fundraisers for personal causes. Let’s explore how you can accomplish both. Begin by logging into Facebook and looking at the menu to the left of your newsfeed. Underneath the “Explore” tab, you’ll find “Fundraisers.” Click on this. This will take you to the Facebook fundraising home page. In the middle of the page, you’ll see a button that says “Raise Money.” Click on it. 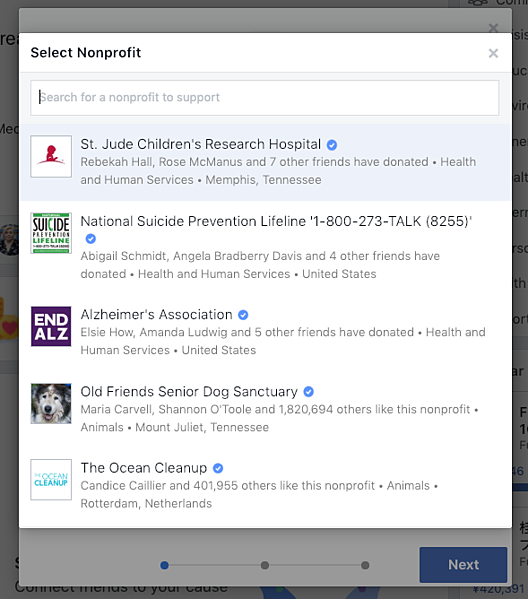 From here, you inform Facebook that you’re raising funds for a nonprofit. You will then be able to select a nonprofit by searching their list. Once you’ve chosen a nonprofit, Facebook asks you to fill in some details such as the desired amount to be raised, and the desired end date. You’ll also have the opportunity to write your own description for the nonprofit, or use their ready-made information. While there’s no harm in using the description they’ve provided, it might be a more impactful fundraiser if you take some time to explain why this nonprofit is significant to you. Once you’ve done this, you will be prompted to select or upload a cover photo for the fundraiser. Click “create,” and your fundraiser is ready to go! Friends, family, and strangers can all donate through the Facebook fundraiser and the nonprofit will receive funds directly. Because the cause is personal, you’ll want to select one of the previous options. Note that both of these options take you through the same steps. Facebook will ask you for some details to include in your post, such as how much money you’re hoping to raise, and the timeline of the fundraiser. Next, they’ll ask you to select a category that best represents your reason for raising money. You’ll need to name the fundraiser and provide a short, yet compelling description of why you’re raising money and how their contributions will be used. Next, you’ll select a cover photo from your own files, or from Facebook’s templated options. After you’ve provided all of these details, click “Create” to activate the fundraiser. Friends, family, and strangers will be able to donate to your cause until your pre-determined end date. Facebook fundraisers are a great way to connect with your peers over a cause that’s important to you. Fundraisers aren’t just for individuals, either. As a business, it’s a way to involve and engage your community in a public act of giving back. It shows your customers and investors what you care about while also raising awareness for the nonprofit itself.